I just thought that the results from the last fun poll we had on this blog were interesting enough to mention. Out of the 11 choices, each and every option had at least one vote with the highest number being three (a three way tie between Catholic, Emergent and none of the above). 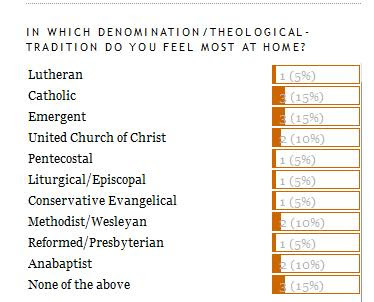 If this is at all accurate, then there is quite an eclectic group reading or at least stopping by this blog, ranging pretty evenly from liturgical/episcopal to conservative evangelical. I thought that was pretty interesting. For those who voted "none of the above" I'd love to hear what your response would have been had there been more options. Keep reading, keep commenting. It's nice to know I am accountable to a variety of theological perspectives.